During the August break Michal organised a holiday club. She was assisted by Cindy and her family from the USA. I attach Michal’s newsletter about her visit, which I am sure you will enjoy. Very best wishes to you all and special thanks to the holiday team. I first came to Kinamba Project while I was backpacking in Africa. Staying longer in Rwanda and volunteering in Kigali was a quick decision. But when I came to meet Meg and to see the project I knew it was the right decision as well. After I got back home to Israel I wanted to turn my connection with the project into something sustainable. So here I am now, for the 3rd time, walking into the gate of the school. This time with no backpack, but with a suitcase full of equipment and a detailed program for a holiday club. These two weeks have been very busy- working with Primary 3 in the mornings; a big group of energetic and exited kids and with Primary 4 In the afternoon; a more quiet and mature group, but no less curious. I have been grateful for the extra help we received from Cindy and her 4 children- Luke, Katie, Mark and Megan. This lovely family came in every morning with a smile on their faces, happy to join in and to help wherever needed. Lots of craft, group games, colouring and worksheets. We travelled around the world and climbed the Pyramids in Egypt. After that we decorated ourselves with face paintings. Some of the kids challenged me with their requests and I did my best trying to fit the Holy Bible on someone’s cheek. When we learned about Native Americans we were amazed to discover an unknown Native American tribe here in the project! We used up plenty of energy in sports day. 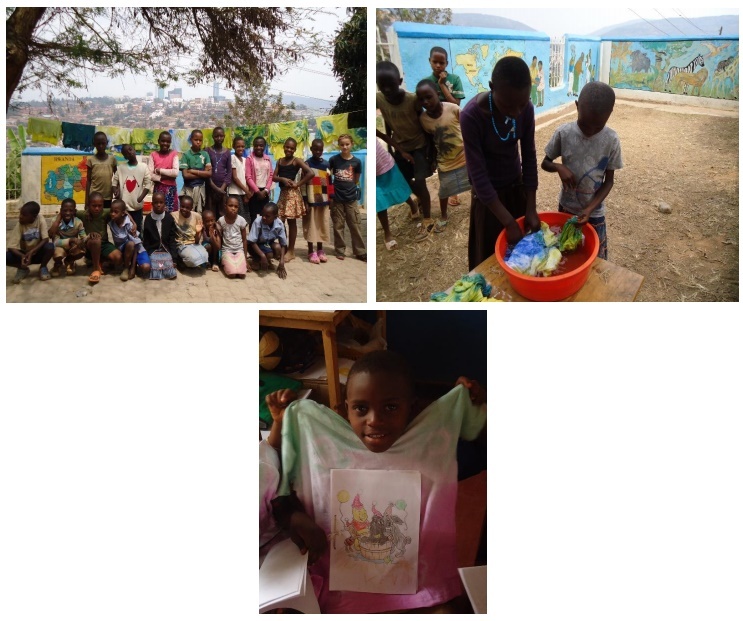 The two big highlights of the club were making chocolate biscuits, and tie dyeing T-shirts that each child got as a souvenir, along with a book of his drawings, on the last day of the club. It has been a great honour for me to be back here again and I hope the rest of my visit will be as nice as its first two weeks. Well, I am sure it will be.